Hospitals, though a places of healing, are also places where patients get sick just from being there due to the widespread problem of “healthcare-associated infections” (HAI). According to the Centers for Disease Control and Prevention (CWashington DC), approximately 1 of every 25 hospitalized patients in the United States has an HAI at any given time. About 722,000 hospital patients contracted an infection during their stay in 2011 alone. These infections are caused by bacteria and viruses that can thrive in a hospital, including on the equipment and instruments that come into contact with the body. Central lines are one such piece of equipment, and central line infections caused by improper cleaning, maintenance, or use of central line catheters can make patients extremely sick or even result in death. At The Rich Firm, PC, our Washington DC, central line infection attorneys help individuals and families obtain compensation for injuries and loss caused by the failure of hospitals and staff to properly prevent, monitor, or treat a central line infection. What Is a Central Line Infection? 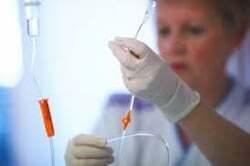 A central line, also called a central venous catheter, is inserted through the skin into a large vein and provides medicine, nutrition, fluids, and blood products to patients. These tubes, which are usually inserted in the neck, chest, arm, or groin, are often left inside the patient without being changed for days or weeks at a time. This can lead to the development of bacteria at the site of the central line which can then travel down the line and into the bloodstream. Once in the blood, these bacteria can cause serious and sometimes fatal blood infections. Central line bloodstream infections are often fatal. Of the approximately 250,000 central line infections which occur in the U.S. each year, up to 25% or 60,000 will result in death. This is especially true due to increasing bacterial resistance to antibiotics. What makes the problem of central line infections even more tragic is the fact that many if not most such infections are preventable. Proper hand washing by all medical staff can greatly reduce the risk of infection. All central line equipment, gloves, and gowns should be sterilized as well. When bacteria and central line infections develop because hospitals and medical staff failed to follow accepted standards of care in cleaning equipment and maintaining a sterile environment, injured patients may have a claim for compensation. At The Rich Firm, PC, several of our experienced Washington DC central line infection lawyers are also licensed medical doctors. This unique combination of medical training and legal experience allows us to efficiently identify potential surgical errors without the need for outside experts. This can save our clients the delays and expenses normally associated with expert review of your medical malpractice case. No one should have to suffer because of the negligence of those responsible for our care, health, and well-being. 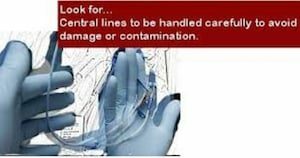 When the doctors and medical professionals we trust with our health and well-being are negligent and a patient is injured or dies as a result of preventable central line infections or other surgical errors, The Rich Firm, PC can help. Our medical malpractice lawyers serving Washington DC, Maryland, and Virginia stand ready to provide experienced and aggressive legal representation. Please give us a call at 888-RICH-LAW (742-4529) to set up your free consultation or contact us online. We look forward to assisting you.